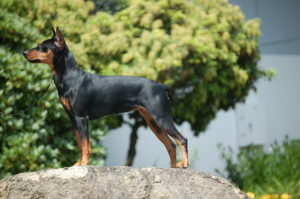 The German Pinscher Club of America, Inc. is the Parent Club for the Breed in the United States. The GPCA became the AKC National Parent Club in 2002 and an AKC Member Club in 2005. The GPCA held it's first AKC approved National Specialty in November 2003. The GPCA holds a yearly national specialty show. Obedience and Rally trials, tracking tests and other events are offered as available during our nationals weekend under the rules of the AKC. The GPCA has recorded the first AKC Champion, Agility, Tracking, Rally, and Obedience titlists and will continue to record new titlists as the list of sports owners can participate in continues to grow. The German Pinscher Club of America was founded in 1985 by several West Coast German Pinscher enthusiasts. Mr. Mike Mueller was the first President of the GPCA. From 1986 through 1990 the driving force behind the GPCA were Rodger Brasier and Dianna M. Jones. Due to the rarity of the breed during these early years, the club subsisted on the generous donations of it's limited membership. Rodger Brasier and Dianna Jones attended numerous AKC and rare breed events with their GP's to distribute written information and answer questions from the general public. From inquiries generated by advertisements in National Dog Magazines the membership in the GPCA continued to increase and by 1991 the active membership and the German Pinscher breed reflected a national population of German Pinschers. To conduct sanctioned matches, specialty shows, obedience trials and tracking tests under the rules of the AKC. Club documents are available to member by logging in to the members only site.